Last week we hosted our annual WWII day camp for 4th-6th grade students. This is part of the reason for my lengthy blog silence as I’ve been working like a mad women to make sure everything was just right for our campers. But I digress…. One of my favorite aspects of camp is that we serve ration-era snacks to our campers. Some snacks are a huge hit (think butterscotch cupcakes) and others receive a less than enthusiastic response (oat sticks for instance). This go round we served Sugarless Berry Ice Cream, and overall, it was well-liked by our young food critics. The recipe is incredibly simple – although a little labor intensive – but the results were well worth the work. Basically you take one can of sweetened condensed milk and mix it with a 1/4 cup lemon juice and a pinch of salt. Next you puree and strain roughly pint of any type of berry (I used strawberries). Then you fold in the puree into the milk mixture. Then, whip 1 cup of heavy cream until stiff and fold that into the existing mixture. Finally, pour the mixture into a freezer-safe container and pop it into the freezer for a couple hours. I would recommend allowing the ice cream to thaw for a few minutes before scooping or you just might bend your ice cream scoop. 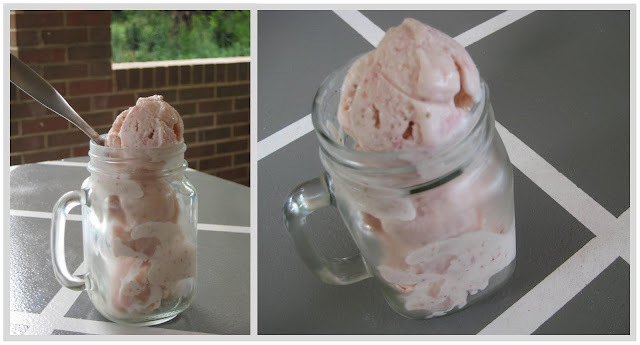 But this recipe is so simple that you could whip it up in a few minutes, set it aside, and enjoy a delicious frozen treat in the sweltering July heat. Hayes, J. L. (2000). Grandma’s wartime kitchen: World War II and the way we cooked. St. Martin’s Press: New York, NY.